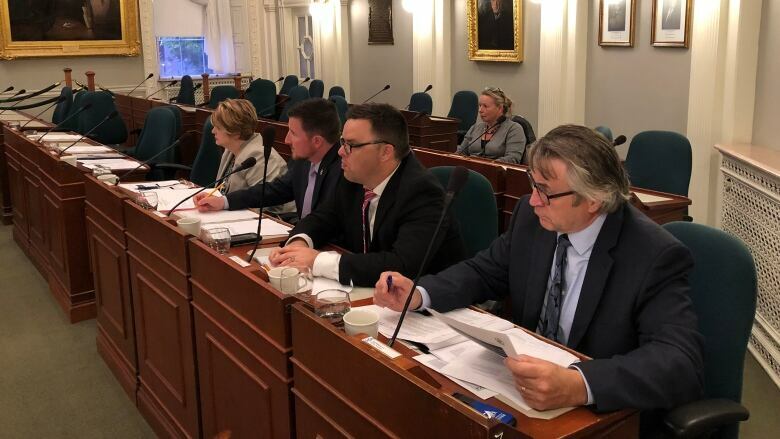 After limiting the work of the Nova Scotia Legislature's public accounts committee to topics reported on by the auditor general, Liberal members are further narrowing the scope of the body. Liberal MLAs who sit on the Nova Scotia Legislature's public accounts committee have, once again, used their majority to further limit the work of the once-powerful accountability body. Last September, the governing Liberals voted to restrict the committee's work to topics dealt with in reports filed by Nova Scotia's auditor general. That decision sparked a short-lived walkout by the opposition parties. On Wednesday, Liberal members rejected topics put forward by PC and NDP MLAs. The PCs had wanted to discuss the "mental-health crisis in Cape Breton," while the NDP had sought to add "family doctor resourcing" and "managing home-care support contracts" to a future agenda. The issues were examined in Auditor General Michael Pickup's November 2017 report, but backbench Liberal MLA Ben Jessome argued Wednesday they should instead be dealt with at the newly established health committee. "Having the Department of Health into this committee would be counter to the way that we're looking to proceed with this committee," he said during a five-minute discussion on future agenda topics at public accounts. "The Department of Health should report to the standing committee on health." The PC MLA for Inverness, Allan MacMaster, accused the Liberals Wednesday of unilaterally changing the mandate of the public accounts committee. "The rules state that this committee has the power to bring government departments and officials before us to answer questions about public expenditure and the results of that expenditure," he said. "So having these subjects before the committee here is perfectly well within the rules of the House." "The only reason the members on the government side don't want it is because they're trying to control the agenda of this committee," he said. "They are trying to shut down discussion on these topics." MacMaster said the governing party can only change the rules of the committee with a two-third's majority vote in the House. A New Democrat committee member, Dartmouth North MLA Susan Leblanc, called the move by the Liberals "an abomination of democracy." The decision by the Liberals means that while the public accounts committee can continue to question Pickup on health issues in his reports, any followup with department or agency staff would be handled by health committee members who have not been briefed by the auditor general.